Samsung Galaxy S9 and S9+ have finally ready to hit the market, bookings have already been started. Galaxy S9 and S9+ are the most awaited Samsung phones of 2018. Both the phones have a thin, skinny profile and an eye-catching design. So you wouldn’t want to make them heavy and bulky with regular protective cases. But the smartphone still needs some degree of protection to keep the beauty and original looks of the phone intact for a long time. 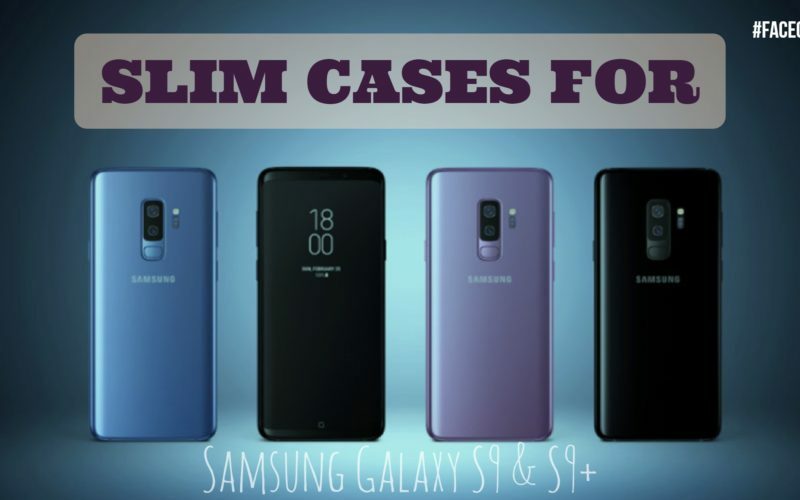 That’s why we have compiled this list of best slim cases for Samsung Galaxy S9 and S9+. Though the Samsung S9 and S9+ look similar to the S8 and S8+ respectively, some hardware changes are being made in the Galaxy S9 and S9+. Let’s have a look at some of the best Slim Cases for Samsung Galaxy S9 and S9 Plus. Starting the list with the most affordable ones, we have Asmart thin TPU bumper case that perfectly covers your phone. But unlike regular cases, it is sleek and just doesn’t add much weight to your phone. Thus, your phone doesn’t lose its sleek design appeal. But does this case prevents your S9 and S9+ from shocks and drops? It comes with air cushion technology that delivers military-grade protection despite having the slim profile. Its sleek brushed textured design prevents fingerprints. The bezels are slightly raised to protect the screen. You get three color options to choose from for both the Samsung Galaxy phones, S9 and S9+. Sleo Hard Slim fit is a soft case comes with a tough rubberized back that gives you a slightly slimmer looks as compared to the former one. But the screen doesn’t get adequate protection. But one should not be looking for that much when looking for slim cases that too for a curved display. Sleo offers various color cases for both Samsung Galaxy S9 and S9 Plus. Its hard bumper holds your phone like a glove and gives a smooth touch when handheld. The whole cover is made up of polycarbonate plastic that gives your phone exceptional protection with the sleek and stylish looks that matches with the astonishing looks of the newly launched Samsung Galaxy S9. If you want your phone back to be covered with beautiful skins that also adds a thin shock absorption layer, Aliber Soft TPU covers are made for you. You get the option to choose from more than ten high-quality cases for both S9 and S9 Plus. These covers are anti scratches and anti-fingerprint that prevents your phone from day to day scratches and shocks. All the buttons, sensitivity features, and jacks operate perfectly with the cover on. You even get the wireless charging support. If you want your Samsung Galaxy S9 or S9 Plus to look different with decent protection while maintaining its slim feel, these covers would be a great option. Vinve TPU bumper case for Samsung Galaxy S9 and S9+ would not be the best-looking case, but it is surely one of the best slim profile case that offers the high degree of protection. The back side is transparent, and the sides are available in three color options, which are Blue, Black and Red. It defends the phones from scratches and drops while maintaining the slim and lightweight profile of the S9 and S9+. The Case for S9 is a bit cheaper than the S9+, but both are made of same material and thus offers the same level of protection. You must have noticed one thing till now, can you guess? Let me tell you, all the cases here provides decent protection with a slim and lightweight profile. What changes is the design, feel, material and color options that you get. That’s why we have added plenty of best options to choose from so that you can get the case that not only offers protection but also matches with your style statement. Tozo PC+TPU hybrid is an ultra-thin case that perfectly fits on your S9 and S9+, keeping in mind you have the right case type. It is available in two color variants; one is fully transparent and the second one has a translucent black color finishing on the sides leaving rest of the surface transparent. It is precisely designed to fit your phone perfectly and doesn’t interfere with the sensitivity features. You get ample amount of space to connect your headphones and charger to the phone. The Hontech Ultra-thin case for Samsung Galaxy S9 and S9+ is a hybrid structure made up of a clear back panel with TPU edges and a polycarbonate frame. The soft edges prevent your phone from sudden drops. The back panel not only lets you showcase the real beauty of the Samsung Galaxy S9 phone but also prevents it from scratches and dust. All the segments are precisely cut leaving ample amount of space for speakers, charging point, and the headphone jack. This case also supports Samsung Galaxy S9’s new wireless charging feature. Hontech case is available for both the S9 and the S9+ with three colors options for each model. Not everybody wants a transparent case for their phone. If you are one of those who wants to give your S9 a different look from the backside, Spigen case is for you. Spigen’s Thin, fit Galaxy S9 and S9 Plus case feature a light but durable slim profile. It is available in five attractive color variants for both the phone S9 and S9 Plus with a little price difference. But what separates it from other case is the QNMP metal plate that supports car mount with QNMP compatible slot. QNMP metal plate may disrupt the wireless charging, but thankfully the plate is removable. This Spigen case perfectly fits on your phone to provide robust, reliable protection while maintaining its slim and lightweight profile. Again, we have a Spigen Air Skin Case for Samsung Galaxy S9 and S9+. But this one doesn’t come with a QNMP plate and is designed to optimize wireless charging. It is slightly heavy still maintains that minimal thin and slim form precisely designed for the S9 and S9 Plus. It provides better all round protection than the former Spigen case. That’s why Spigen Air Skin case made it to this list of best slim cases for Samsung Galaxy S9 and S9 Plus. The rigid polypropene layer is anti-scratch, anti-fingerprint and gives a comfortable grip over the phone. V VRS Design transparent case is a single layer full body protection for Samsung Galaxy S9 and S9 Plus. Unlike regular transparent cases, this hybrid cover has a crystal clear body that lets your phone flaunt its beauty while preventing it from scratches and shocks. It is durable, flexible, slim and lightweight that users look for while looking slim case. Its unique PC material prevents it from yellowing. Plus, it features a standard design protocol that makes it compatible with most wireless chargers, screen protectors as well as other third-party accessories. The last slim case is from Caseology Skyfall Series. It is available in three color strips for both the phones Samsung Galaxy S9 and S9+. It features a dual-layer construction of TPU and PC material that protects your phone without adding weight and bulkiness to your phone. The responsive button covers the phone with crisp tactile feedback. Also, a raised fingerprint sensor bezel and front lip protection give your phones all-around protection from day to day shocks and accidental falls. This Caseology case doesn’t disrupt the wireless charging as tested with most of the wireless chargers. Overall, this might not be one of the thinnest cases, but it surely has the durability, shock absorption capability and ultra-clear material that makes it worth to invest money.